Okay, as a kid my dream was to write a science fiction paperback. Not a hardback — those were for dictionaries — but a cheap, lurid paperback that I could buy on the rack at K-Mart. Done and Done. Well, almost done. K-Mart still doesn’t stock me. But cheap and lurid? Check. But before THAT dream, there was this out-and-out fantasy: to write and draw my own comic book. Then I found out around age 12 that my artistic talent went no further than being able to draw Captain America’s face. Just one expression, a kind of Kirbyish rectangular smile. Though I have to say, I totally nailed the cheek bones. So, then, just writing a comic. Wouldn’t that be great? Alas, even after I grew up and started generating facial hair, I had no idea how to break into comics. Then I met Chris Roberson and his wife and business partner, Allison Baker. I told them my fantasy (always a dicey proposition). They nodded sagely. See, Chris and Allison run indie publishing house MonkeyBrain Books, and Chris writes prose as well as comics, so as far as I’m concerned, they’re living the dream. Fast forward two years. I get this email from Matt Gagnon at Boom! Studios, saying, Chris Roberson said you might be interested in writing comics — how about this one? With Kurt Busiek? (For those of you not into comics, replace the name “Kurt Busiek” with “Jesus Christ”.) I think I clicked Reply before the email had fully loaded onto my screen. He’s back from the dead and starring in a new ongoing horror series from the mind of Kurt Busiek. 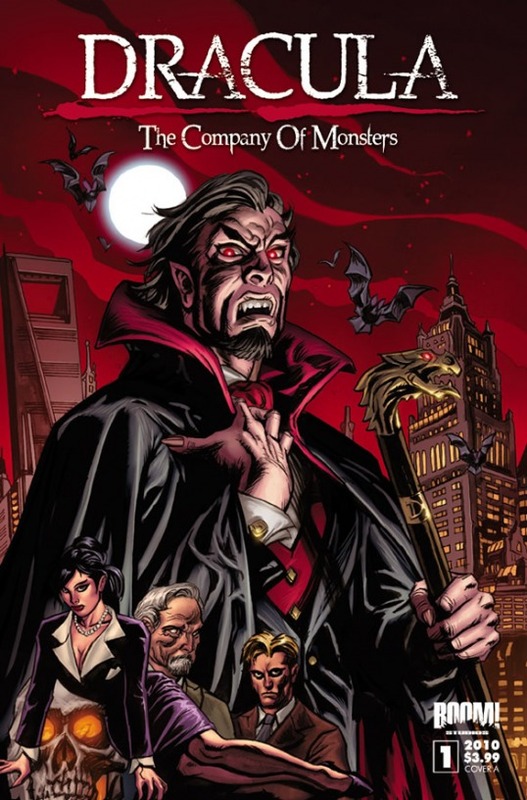 A powerful, predatory corporation acquires a valuable asset – Dracula! They think they own him, but no one can own the Son of the Dragon. There’s a monster in their midst that puts Hannibal Lecter to shame – and he plans to gain his freedom in blood. It’s bloodsuckers vs. bloodsucker, as Busiek brings an incredibly modern spin to the Dracula mythos. Joining Busiek is award-winning author Daryl Gregrory (Pandemonium) and rising star artist Scott Godlewski (Codebreakers). 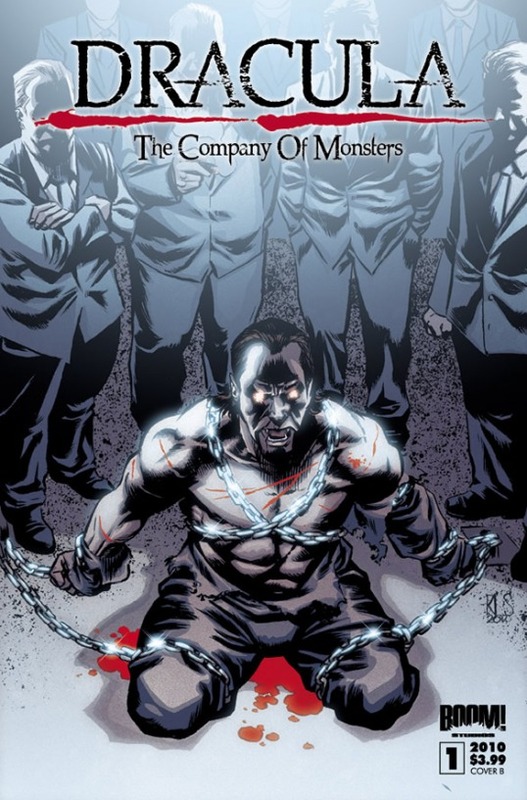 The epic journey starts here, so don’t miss the debut issue of Dracula: The Company Of Monsters, the next breakout ongoing series from BOOM! Studios! Featuring covers by Ron Salas and fan-favorite The Nocturnals artist Dan Brereton. Kurt (I call him Kurt now, or just JC) came up with the idea, the background, the main characters, the outline of the plot–basically, the story bible. Scott Godlewski is the artist. And me, I’ll be writing the word balloons. Now, that may sound like a trivial thing to you, mister, but I’m nervous but amped up beyond belief. Fortunately, last week I was at the Clockwork Storybook retreat. Did I mention that Chris and his friends invited me in to to their rock ’em sock ’em writer’s collective? Last week was my first time to attend their annual get-together, and Chris, Matt Sturges, Bill Willingham, Mark Andreyko, Bill Williams, and Mark Finn gave me a crash course in comics. Everything from how many words fit in a balloon, to why five-panel layouts work so well, to who the best people are to work for in the biz. (As well as who the crazies are.) Every day was an eye-opener. And now I get to try it out for myself. Issue 1 ships in August. Let the biting begin. And all you people googling for Final Fantasy, the video game? Sorry about that, I just couldn’t pass up the title. I’m normally not big on Vampires but Daryl Gregory and Kurt Busiek? I’m there. Sweet, and congrats! I’ll definitely be looking forward to it. Writing comics has always been a dream of mine as well, and this sounds like a rad one! That sound you hear? The one like a cauldron of bubbling, boiling oil? That’s my seething jealousy. Holy crap, dude! KURT BUSIEK! That’s freaking amazing! Congratulations! I can’t wait to see what you do with this. And Adam: Yeah. Ever since this got rolling, I’ve been saying his name in all caps like that. I’m even jealous of myself. And Kurt told me that rather than “Jesus Christ,” he prefers “His Majesticness the Ascending One.” So work on that, people. Really looking forward to working with you on this, Daryl! Dude, I am frothing with envy and happiness for you. Two kinds of froth!! Congratulations! Hey, it’s morning, and I’m still writing a comic book! Thanks for stopping by, folks. And everybody check out Scott’s site for examples of his work — http://scottgodlewski.com . I especially love the pulp-flavored stuff. Awesome news, sir. Nothing fulfilling those dreams. Looking forward to it. Nothing LIKE, that is. Stupid fingers. Mark, that’s because you type wearing a bunny suit. I’m just sayin’. Actually, I was searching for Final Fantasy, the unpublished comic book by Kurt Busiek. Really. Best info I’ve found on it (including a few answers from Busiek himself) is at http://forums.comicbookresources.com/showthread.php?273180-Series-that-never-Saw-the-light-of-Day/page4 . But I’m curious how far it got before it was scrapped. Well, may as well ask him; he’s pretty active of Formspring.